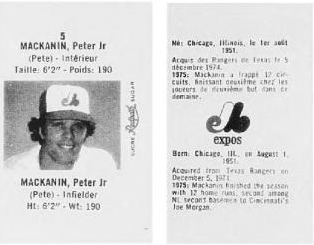 Number 5 Type Collection: 1976-77 Redpath Sugar Montreal Expos Baseball #5, Pete Mackanin, Jr.
1976-77 Redpath Sugar Montreal Expos Baseball #5, Pete Mackanin, Jr. In a hobby world that treats Post cereal and Hostess snack baseball sets as normal, is it odd that someone would cut out the "grain" middleman and attach players directly to sugar? They're hard to find today, but it did happen at least once, thanks to that bastion of maple syrup and Tim Horton's to the north. 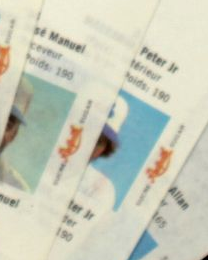 Redpath Sugar, then based in Montreal, printed packets featuring les Expos for two years in the mid-70s. Each showed a color bust photo, bilingual bio text, and uniform number. The above scan (click for detail) shows several uncut and unfolded sheets, with four players each. Price guides checklist the set by uniform number, so utility infielder Pete Mackanin (career stats) got #5 in both years of production. I nipped this black-and-white scan from an SCD price guide because Pete's barely visible on the uncut sheets. The bio notes his 12 homers in 1975 trailed only Joe Morgan (17) among NL second basemen. A closer look at a bit of Pete on those uncut sheets. 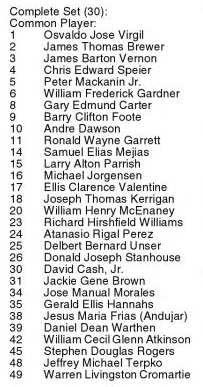 Redpath Sugar printed 36 players in 1976, including 3 guys with no uniform number (Wayne Garrett, Chuck Taylor, and Del Unser). 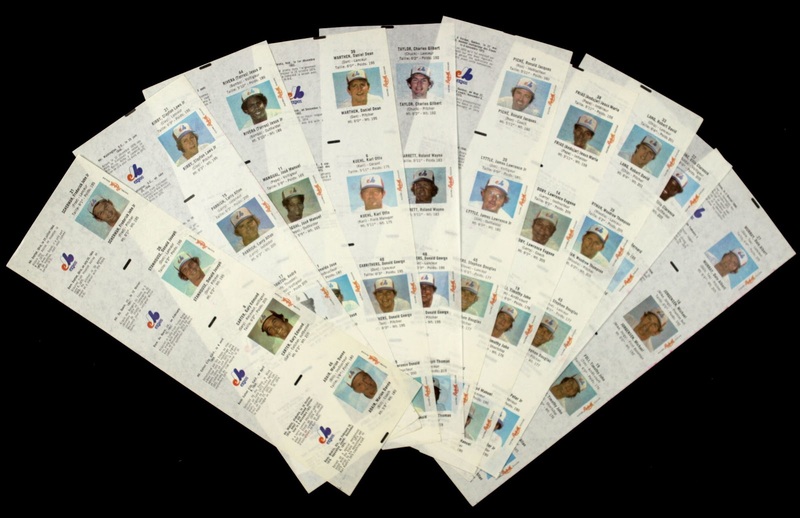 They cut back to 30 for 1977, but everyone received a number. Online checklists list players alphabetically, so I searched the SCD for "Redpath" using Google Books to get these numbered lists. Value: Single packets, if you can find them, cost a few dollars. HOFers Gary Carter, Larry Doby (Expos coach in 1976), and Andre Dawson run $10 and up. Fakes / reprints: Haven't seen any in the marketplace. The set's so obscure, I doubt many people would jump at the chance to buy one, let alone generate enough demand to encourage fakes.